Following a question at the AlgLib Forum I have added the Hermite spline fit function to the AL-Spline-Matrix collection. The revised spreadsheet, with full open source code is available for download in 2007/20010 version and pre-2007 version. This entry was posted in Excel, Maths, Newton, UDFs, VBA and tagged Excel, hermite spline fit, UDF, VBA. Bookmark the permalink. Hi Dave, Great site, I visit it regularly. It would be good if I could put you on google reader so that I am kept informed when you have a new post. 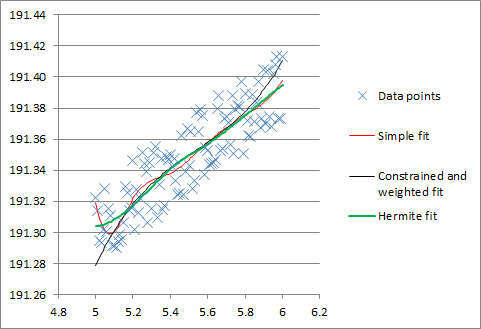 The Hermite fit function looks very useful, however, the spreadsheet that I downloaded has a “ref!” error fspec named range hence the macro is not running. What range should I refer to to get it to work? Mike – I’m not sure why your function isn’t working, the rane name fspec isn’t used. I have now deleted it, and also fixed some function names at he bottom of the interpolation sheet which I’d forgotten to update before. I can’t get into my web site at the moment, but I’ll upload the new sheet as soon as I can. Hi Doug, Just tried it on a dataset of 2500 points and it worked out perfectly and very fast. Have been looking out for something like this for ages. Need to read up on Hermite Spline best fits. The “M” constant obviously affects the output. I set mine quite high and got the results best for ~18. It must have something to do with the sensitivity. Mike – M is the number of separate curves that are fitted to the data. For a widely scattered data set (like in the example in the spreadsheet) a low number is usually best. If you are fitting to a complex shape with low scatter then a high number may well be better.